As forecasted the wind began to buffet the trailer about 4 in the morning. I had seen the weather forecast for high winds today, especially on Mount Wheeler summit, but I had hoped to settle into my campsite Thursday night, leaving all of Friday for peak bagging. However, with yesterdays late arrival, short hike and no summits, today wasn't looking much better. I ate an early breakfast and checked out the spotty internet connection to find out what time the Lehman's Cave visitor center opened. With tours sold out yesterday, I decided to try early to get a ticket for the afternoon leaving the morning for more hiking. The Center opened at 8:00 am and it was past 7:30 am now. I finished my breakfast and headed down the mountain (thankfully no trailer in tow this morning). Lehman Caves are a big highlight in the area and can only be entered through a guided tour. When I arrived shortly after 8:00 am (I mean like 8:05) there was already a long line at the ticket counter. Cave tour reservations are offered online and therefore are regularly sold out. While waiting in line I kept hearing the park ranger tell the guests before me that only the 10:00 am Grand Palace Tour was available. The Grand Palace Tour is approximately 90 minutes long and travels 0.6 miles through the underground caverns. Perfect. With the morning looking beautiful, and the occasional gust of wind to remind me that I probably made the right choice I decided to wait at the Visitor Center for my tour to start. Lehman Caves Visitor Center is small with the typical books, maps, and pictures. This Visitor Center differs from other Visitor Centers in that is has "The Forgotten Winchester" on display. I remember when it was found in 2014. 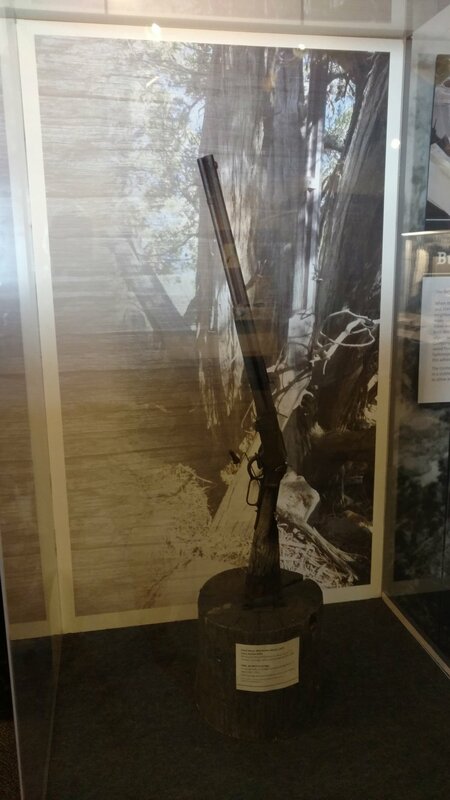 One hundred and thirty two year old rifle found leaning against a tree in the park. What a find. 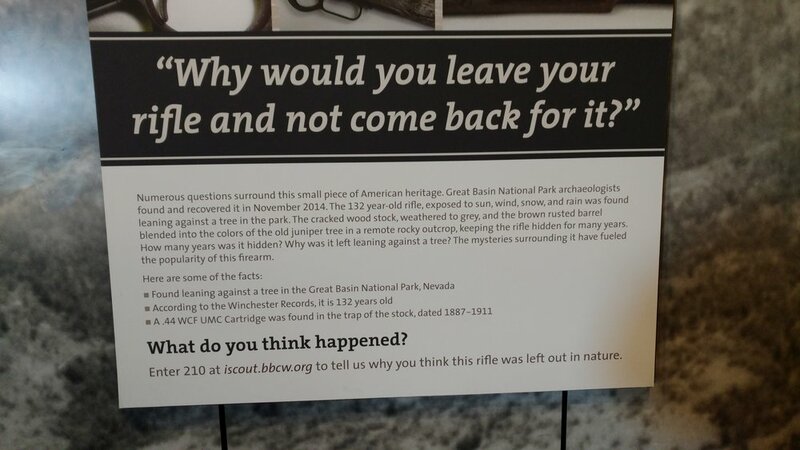 Questions surround the rifle, but it got left behind somehow and lost. We've all done it, maybe not with a rifle, but phones, car keys, and books. It was fun to read the story, but soon I had made several rounds in the small center and decided to go next door to the gift shop / food court and enjoy the view while I waited. One doesn't notice the rise in elevation after leaving Baker, NV and driving up to the Visitor Center. But looking down toward the valley and Baker, it is a large change in elevation. I did a little reading on my phone, decided to try the homemade chili and bread. After a few bites I began to worry that eating chili and going underground might not be a good combination, but thankfully no problems or emergency evacuations were needed. And finally my tour time arrived. The tours are divided into groups of 20. This seems to be a good number and it is not to large for everyone to fit into some of the small caverns, and not so small that only a few get to enjoy a tour when they visit. Our tour guide was from St. George and was obviously passionate about the outdoors and caves. 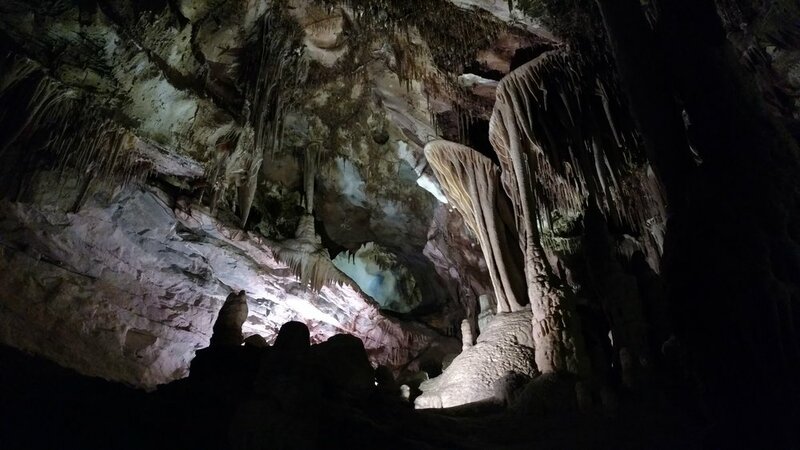 According to our tour guide (an Wikipedia to aid in recall) "The Lehman Caves were originally protected as a National Monument in 1922, which was combined with the national park in 1986". "The caves were "most likely" discovered by Absalom Lehman in 1885" at least Absalom Lehman is credited with finding the cave. Again, according to Wikipedia, "The caves are made up of a marble and limestone solution, for the most part, that forms the many cave decorations throughout the caverns". This is probably my third time through the caves. Once when I was very young. The second time was a school trip with Sean (5th grade) by school bus no less. And today. Each time I am thrilled with the prospects of exploring an underground cavern such as this. I then look down at the cement walkway beneath my feet, the hidden cables and lights, and I realize this would be a totally different experience if one were actually exploring this realm for the first time. The cavern was crowded as our small group made it's way through the system. Pausing several times to wait on other small groups who zig zag through the various rooms on tours of their own. Some shorter and more direct. Others on specialized tours. With the tour over and lunch time approaching, I head back to my trailer to eat and gather my pack. I hadn't planned on taking the tour in the middle of the morning and so didn't bring anything else with me. After a short lunch, I head toward Wheeler Peak. I've summited this peak before and it is stunning. It is also windy and at certain points on the mountain, the tree sway reminds me just how strong it probably is on the ridge line and summit. I park in the crowded trailhead parking lot and start my hike. The sky is stunning, the lingering snow breathtaking against the rugged backdrop of Wheeler Peak and Jeff Davis Peak. I visit with a few hikers returning, but most were not returning from the summit. The wind is simply too strong above tree line seemed to be the consensus. The wind is a southernly wind and so the majority of it is being blocked by the mountain itself. Add the trees which also block the wind and it is a pleasant stroll along the trail. I finally meet a couple who are returning from the summit. They look hammered and tell me that every step was a fight for balance on the steep hillside. Add the snow and some areas were simply dangerous. I press on, but acknowledge that I'll probably not reach a summit today either. I break above tree line and instantly know this is going to be a relative short hike. I was hoping to make a final judgement from the ridge line and still be able to climb the smaller Bald Mountain, but it is just not going to happen today. It's a stunningly beautiful day, but I hate the wind and apparently I'm not the only one as the trail only holds returning travelers. Disappointed in not reaching any summits, I return to the trailer and pondered my goal to reach 60 peaks for my 60th year. My birthday was last month and I have only reached 20 peaks. I had hoped to reach 5 summits on this trip alone. As I gazed up at the mountain side I cautioned myself about that line of thinking. Here I am in one of the most beautiful, amazing places in the world. Disappointment simply shouldn't exist in this type of environment. I may or may not hit my goal of 60 peaks this year, but I decided I wouldn't let disappointment enter my thoughts again while I'm making the journey.